Beef & Mushroom red wine pie with potato pastry. 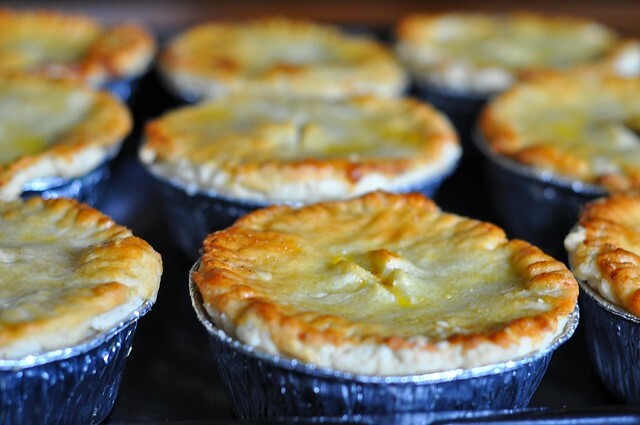 Have always loved meat pies, probably because when I was growing up, there was only one western restaurant in town and their pies were to us what pizzas are to kids now. I balk at making pies because there's so much work, especially since I don't like store-bought pastry. I've told you before about the pastry course I took years ago that made me suspect all pastries. Commercial pastry is made with pastry margarine, a white and waxy fat that doesn't melt easily and so make the crustiest and shortest pastry because it melts only under high heat which separates the layers of dough, unlike butter which melts when kneaded, resulting in tough dough if not properly handled (my English teacher would give that sentence an 'F'). Just think what that hard margarine does in your blood vessels. Plus, if you've made pastry before, you'll know how much fat goes into it to make it short and flaky. I've never made potato pastry and was surprised at how deliciously short and light it tasted, partly due to the self-raising flour. The potatoes also gave the pastry extra flavor. However, the pastry was soft and crumbly and I couldn't turn the pies out so potato pastry should be used for making pot pies only. If the potato pastry is rolled too thick, the texture can taste rather cake-like so make it about 1/2 cm thin. Since this is not short crust pastry, the texture is soft and crumbly but not very crusty. As for the meat filling, I halved the wine and it was still too much because the wine flavor was over-whelming and the meat filling tasted very tart. I had to add quite a bit of sugar. I wanted to use ground beef because I knew my mom and in laws would prefer that to beef chunks. Ground beef also cooks much faster. But the ground beef exuded too much oil when fried so I ran to the supermarket to get some beef blade to add to the ground beef. Despite cutting the beef into small 2 cm cubes and cooking until it was very tender, Wey said he found the chunks too stringy for his teeth and preferred ground beef so next time, I will get beef blade and mince the beef myself. 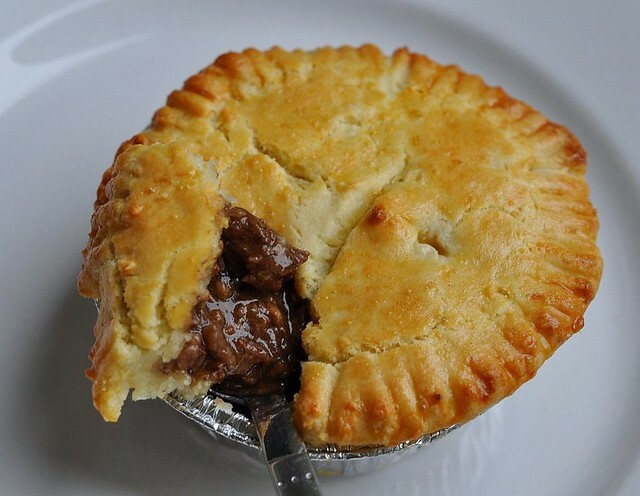 The recipe below is a combination of the beef and red wine pie and beef and mushroom pie recipes in Exclusively Food a wonderful website that I just found and now visit regularly for updates. 1. In a heavy saucepan, add a small amount of oil and brown the beef in very small batches. If you fry too much at once, the beef will sweat and will not brown. I used a heavy nonstick pan (Circulon, love it) and didn't add oil to the mince and used very little oil for the chunks. Set aside. Spoon off the excess oil. 2. Add 1 T oil to the same pan, add the onion and fry until softened. Add the garlic and flour (I didn't add the flour now because I intended to use a pressure cooker) and the beef and remaining ingredients except the mushrooms. Cover and let simmer 1 1/2 hours to 2 hours (30 minutes in presssure cooker) until beef is tender. If there is too much liquid, remove cover to reduce it. However, I found that upon cooking and standing, the liquid will dry up. Pies are best when wet with sauce so do make sure the stew is really slushy. You may have to add more water if not cooking in a pressure cooker. Season. If using mince, add the mushrooms at the same time as the beef and simmer about 30 minutes. 3. Add the mushrooms and cook another 30 minutes. Taste and season if necessary. If using pressure cooker, stir in the flour and cook 5 minutes. Thicken the stew with the cornflour water. When cool, chill the filling overnight for easier handling and for the flavor to develop. 4. Remove the bay leaves and divide mixture into individual ramekins (to the brim), or you can line the ramekins or greased baking pans with short crust pastry (not potato pastry; too soft) with the pastry overhanging the rims by about 1 cm. 5. Roll pastry tops out between sheets of pastry paper. I found the potato pastry very soft, almost like mashed potatoes, and preferred roll and then press it thin in my hands like making pizza bases. Cover the pie tops with the pastry, trim and mark rim with a fork (go here for great step by step photos). 6. Brush pastry with beaten egg and snip a cross on top to let steam out. Bake at 200 C for 25 to 30 minutes until pastry is golden. --Sift flour into a large bowl, rub in the butter, add the mash and mix lightly until just blended. Chill 1/2 hour before using. --This amount is enough for pot pies only. For enclosed pie (pie with a base and top), you need short crust pastry for the base. Oh! you are wicked! Now I got another recipe that I must try!!! This potato pastry looks very yumms! I am thinking of making a variety of fillings.. hehehe.. namely, chicken & mushroom with carrots filling and perhaps a fish with leek filling!! Hehehehe... I will most definitely post these variety of filling pie in my blog when it is done! Yes, when I first learn how to make puff pastry, I got a shocked at the amount of oil oozing out of the pastry when baking. After that, when I had to wash the trays, I got my second nasty shock.. the oil from the pastry is so sticky and hard to come off. And like you, I was thinking of my arteries and heart!! Oh no!! From that day onwards, I stop eating such things and make it a point to educate my daughter on eating such things. Wah so much work! n yes I always mince beef and chicken myself. I never buy the minced ones....all full of fat. good that you found a healtier pastry recipe. I cld do with that but I hate making pies too often...so much work esp in our weather. after over 25 years in the food business i still have yet to acquire an affinity for any type of pastry or bread processes. i know what a good one is, but i'll be damned if i can turn them out. i have always put pies on my cafe and luncheon menus, but only if there was a baker on staff to do the pastry, or i was able to get good pastry delivered from a purveyor. i have always envied you for your pastry skills but i know see that for you too it does not come so easily, or that its simply an pain in the "pie". as always, great pics and if you can ... the next time you make a batch put some in a FedEx box with dry ice and ship them north. food: so are you, your assam laksa is killing me! yeah, my next pie will be chicken pie using exclusively food's recipe:) wait till the family recovers frm the beef pies. zurin:who's talking about so much work! you are INDUSTRIOUS! not kidding. however bad you may think you are, i am sure my skills pale in comparison. lilyann: u love pies too?